This photo of the International Space Station was snapped by an STS-133 crew member on the space shuttle Discovery on March 7, 2011. This story was updated at 3:24 p.m. EDT. 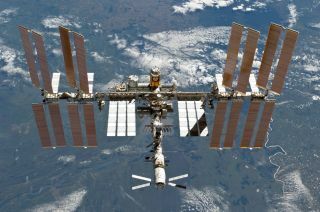 A new analysis of a piece of Chinese space junk zooming so close to the International Space Station today that its crew prepared to take shelter in a Russian lifeboat has revealed that the satellite debris poses no risk to the orbiting lab or its astronauts, NASA officials said. "Tracking data now indicates that a piece of orbital debris being monitored by Mission Control Houston will not pass close enough to the International Space Station to warrant the Expedition 27 crew members taking safe haven within their Soyuz TMA-20 spacecraft," NASA officials said in an afternoon status update. The space junk is a piece of China's defunct weather satellite Fengyun-1C, which was destroyed during a Chinese anti-satellite test in 2007 that created a vast cloud of orbital debris, NASA officials said. Flight controllers had been tracking the debris all day from NASA's space station Mission Control room at the Johnson Space Center in Houston to determine the potential risk it posted to the station and its crew. At about 7 a.m. EDT (1100 GMT), Mission Control radioed the station astronauts to tell them they may need to seek shelter in the Soyuz until the debris passes the space station. After a few more orbits, tracking observations determined that the space debris would not come close enough to warrant any safety measures, NASA officials said. "The probability of a collision became low enough that it wasn't a high enough risk that we would need to shelter in place," NASA spokesman Kelly Humpries told SPACE.com. Mission Control radioed the all-clear to the crew at 2:41 p.m. EDT (1841 GMT) as the space station sailed 220 miles (354 km) above eastern Asia. Humphries said that often times, the unpredictability of a piece of space junk's orbit can initially make it appear to pose a threat to the space station and its crew. But over time, as the orbit is refined with follow up observations ahead of closest approach, the actual threat may decrease, as was the case today. The station's three-person crew includes NASA astronaut Cady Colman, Italian astronaut Paolo Nespoli and Russian cosmonaut Dmitry Kondratyev, who is commanding the mission. NASA and its space station partners usually move the space station clear of any potentially threatening piece of space junk if tracking observations predict the debris will fly within a preset safety perimeter. That perimeter, which is shaped like a giant pizza box, extends about 15 miles (25 km) around the space station and about a half-mile (0.75 km) above and below the orbiting lab. But the process of moving the space station using its Russian-built thrusters or by firing the engines on other spacecraft docked at the outpost takes time. Today's space debris threat comes on the heels of another close call at the space station. That event occurred on Friday (April 1) at 10:36 p.m. EDT (0236 Saturday GMT), when space station flight controllers moved the orbiting laboratory clear of another piece of satellite trash. The Friday space debris event was spotted with much more advance notice than today's threat, allowing flight controllers time to move the space station using thrusters on a European cargo ship currently docked to the orbiting lab, as well as engines on a docked Russian cargo ship and the station's own thrusters. The move, called a debris avoidance maneuver, pushed the space station clear of a leftover piece of space junk from a 2009 crash between two satellites. "The object [was] a relic from a collision between the Cosmos 2251 and Iridium 33 satellites in February 2009 and had been close to the station’s orbit prior to the debris avoidance maneuver," NASA officials said in a statement discussing the Friday space debris event. Space debris has been a growing threat to satellites and spacecraft carrying astronauts because of the anti-satellite test, 2009 crash and increasing number of satellites in orbit. Today, more than 22,000 pieces of space junk are being tracked in Earth orbit. Some military officials have proposed forming an international response to meet the space debris threat. Meanwhile, three new crewmembers are preparing to join the astronauts and cosmonaut living on the space station. A Russian Soyuz spacecraft carrying a NASA astronaut and two cosmonauts is closing in on the International Space Station after launching into orbit on Monday. The Soyuz TMA-21 spacecraft is carrying the second half of the station's Expedition 27 mission crew and is due to dock at the space station on Wednesday afternoon.